Coupons for checks from Vistaprint.com – Looking for cheap personal or business checks online? 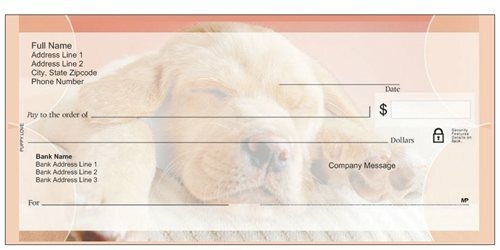 Most people think of Vistaprint for custom business cards, but they also offer discount personal checks with a number of popular designs. Check out these featured coupons below. You can also find a number of new coupons and weekly specials posted on our main Vistaprint coupon page. 20% Off Sitewide + New customers also get free shipping on $50+ orders. – Up to 12 featured coupons; updated daily! The evolution of the internet has freed people from the overpriced personal checks sold at your local bank. They had a nice little racket going there for decades until the internet created something that banks hate: competition. Checks used to cost upwards of $20 per book, but are now a fraction of that price at leading online printing services like Vistaprint. 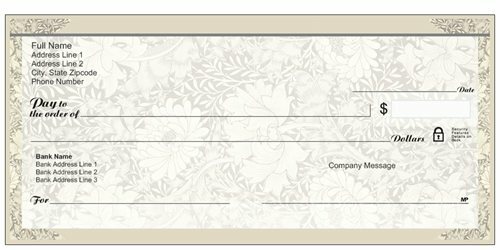 What info do I need to print checks with Vistaprint? If you have an old check, you have everything you’ll need. In fact, our bank (TD bank) scans every check that we write that has been cashed, so if you don’t have your old check book around, you might even be able to see scans of them online through your bank. Anyway, besides your address and phone number, all of the numbers that Vistaprint will ask you for run along the bottom of your checks, including the routing number and bank number. Do they still offer free checks? Vistaprint has overhauled their coupons in the last year, and no longer offers free checks. That’s OK, because “free” always comes with strings attached. (Like that free burrito I was offered in that massage parlor in Tijuana) Anyway, Vistaprint has reduced the gimmicks, and now has more straight-forward pricing on all of their printing. What’s the best coupon for checks now? The best deal on checks is usually when they are featured in the weekly specials page, when certain products are discounted up to 50%, although checks are only featured sporadically.Besides that, every month a number of products are discounted 25%, and if you are a new Vistaprint customer, you can also get free shipping on orders over $25. You can usually compare discounts by clicking more than one link over to Vistaprint.com and compare the pricing. Also, note that you get a little message at the top left of your screen when you click over to their site from a promotional link telling you exactly which coupon code has been applied, along with the terms and exclusions of the offer. Personally, I don’t go for the really crazy checks, like the ones with cartoons, Betty Boop, or kittens on them. Why would I want to see Bugs Bunny staring back at me as I write a painful check to the IRS? My favorite designs from Vistaprint are simple and have antique and classic designs, and you can also choose to add security features for a reasonable extra cost. This entry was posted in vistaprint and tagged checks, personal checks, vistaprint on May 20, 2016 by kevin.